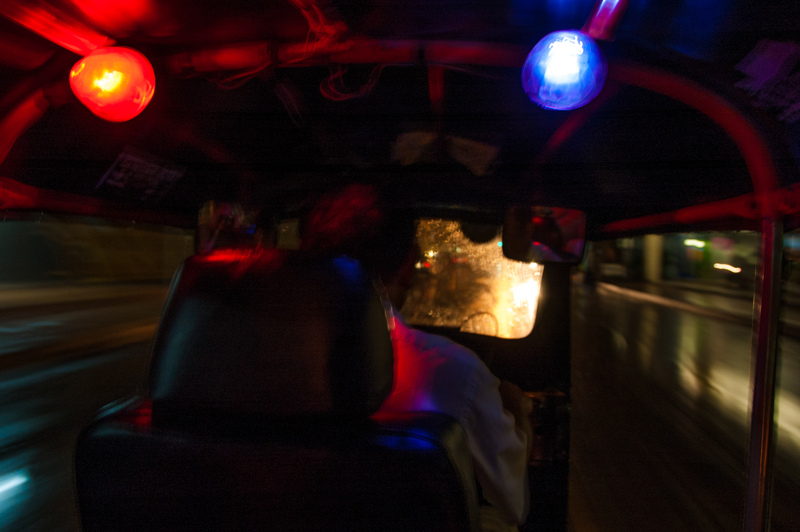 The photo is from the back of a tuk tuk in Chiang Mai, Thailand, I was heading out for some late supper, and normally I would walk around to find a place to eat, but this evening it was poring down, so I jump in to a tuk tuk – a tuk tuk is this moped made in to a taxi, with room for two people in the back – and told him to take me down town. Let me tell you that it’s really hard to take a photo from the back of a driving tuk tuk, they are drive like crazy and the roads are usually quiet bumpy. But anyway that should not stop me from trying, and I really like what I got, what do you think? The Photo is straight out of the box shoot, I only added some contrast and color in the post process. Tuk Tuk Driving by Bo47 is licensed under a Creative Commons Attribution-NonCommercial-NoDerivatives 4.0 International License.